This past weekend's horse trial was a mixed bag to say the least! Dino and I performed a solid dressage test and got some great feedback from the judge, and our first BN stadium course in over a year was a total cakewalk. Cross country, however, remains a major issue at this level, and I've got plenty of thoughts on the why's and how's of that, but let's start from the beginning. One panicked phone call and several texts to my vet later, and she determined that it was most likely either conjunctivitis caused by flies, or more likely he'd irritated his third eyelid in trying to rub his muzzle off. My vet prescribed some eye goo and Banamine, and ok'd us to show the next day. 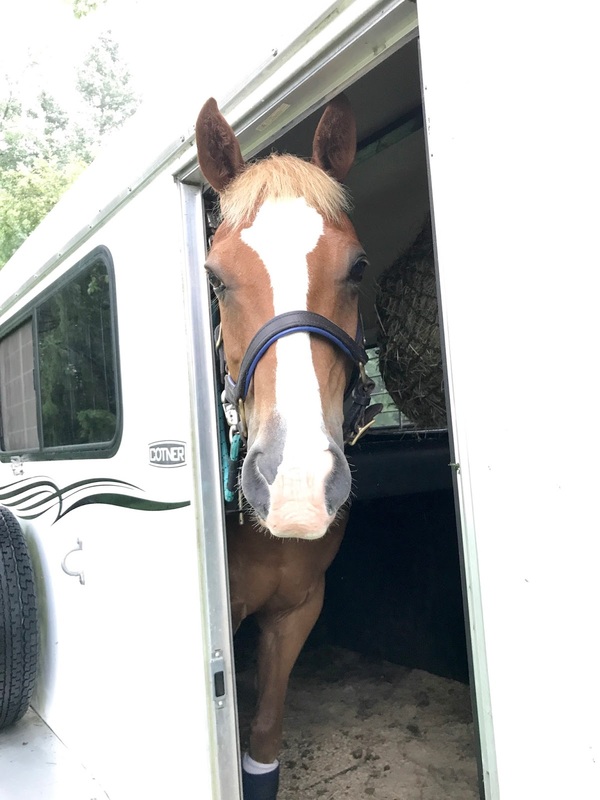 Thankfully, on Sunday morning his eye was pretty much totally back to normal, so we loaded up, picked up a friend and her baby horse, and headed up to the show. I spent most of the morning helping my buddy with her baby racehorse and his excessive feelings, and Dino napped dutifully on the trailer like the pro show pony he is. I got on for dressage with about 20 minutes before our test, and homeboy was ready to rock and roll! I love, love, love how consistent he's been in the dressage and show jumping all year. I get on and there are no theatrics, no tantrums, no pony'tude, he just goes right to work and gives me his best effort from the start. Dino is finally acting like he's an event horse (most of the time!) and it's been great this year to get on and know he's going to be there for me. Needless to say, he warmed up very well and we put in a solid effort for our first time riding BN B this year. I'm still struggling with getting him laterally supple enough to truly relax over his back and maintain a good balance the entire time, but he's gotten SO much better in terms of obedience and being correct in the contact that I really can't complain! We ended up scoring a 31.75, with a sprinkling of 8's and a note reading, "Very talented pair!" at the end. 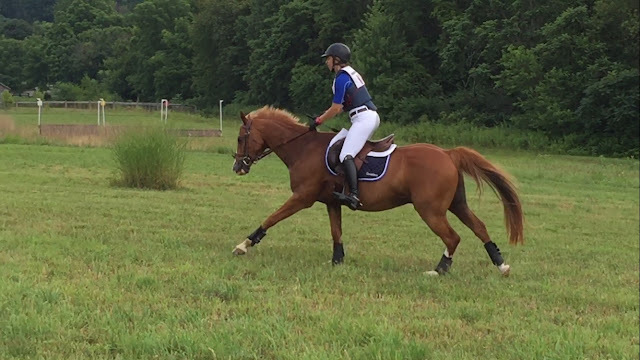 The judge had some excellent feedback for us as well, noting that overall our test was very good, but Dino is lacking in lateral flexibility, which causes him to stiffen his body to seek balance around the turns. I agreed wholeheartedly with her assessment, and it's absolutely something that we'll be working a lot on in our schooling! Best dressage pony! With normal eyeball! Dino has been similarly consistently awesome in the stadium ring all season, and this day was no different. He warmed up like a total professional, lighting up and ready to work as soon as we entered the schooling area. Once over each fence on each lead and we were ready to tackle the course! Remember the first year I tried to show Dino in the jumpers and I had to beat him to get him through the in-gate? Yeah, that's not a problem anymore. We stepped through the gate and my buddy immediately picked up a big, bouncy canter all on his own and started hunting for the first jump! The course was really fun and low on technicality with a nice, loopy track over single fences and a couple long bending lines. Dino was attacking the fences and the whole thing felt like a walk in the park. An easy, clear round for us at BN! It was time for XC. I was, actually, feeling pretty good about the course. There were only a couple fences that seemed a bit big to me, but still very doable. There was nothing trappy about it, and it definitely seemed like an appropriate course for where we are right now. But instead of the fire-breathing cross country machine I had at Fair Hill, what came out of the start box was a sucked-back, unsure pony. I booted him over the first log, and cantered away up the hill, hoping to rev his engine a bit and ride him up to the base of the feeder at Fence 2. Dino never quite got in the groove, I never quite saw a distance, and we had a stop at the second fence before turning around and popping over. Having a pony under me that was uncertain, sucked back, and wasn't hunting the jumps really did a number on my ability to just ride forward and get the job done. At BN, the fences were also just big enough that I did not in any way feel comfortable just kicking him over from whatever random spot he chose. When we did get over a fence, it was in such a spectacularly dramatic fashion that for the first time ever I thought he was going to jump me right off his back. So, for good or ill, I made the decision to retire halfway through the course. I wasn't making things better, Dino was quickly becoming more and more frazzled, and I didn't think I could ride him over the bigger fences in the way he needed to be ridden in the moment. 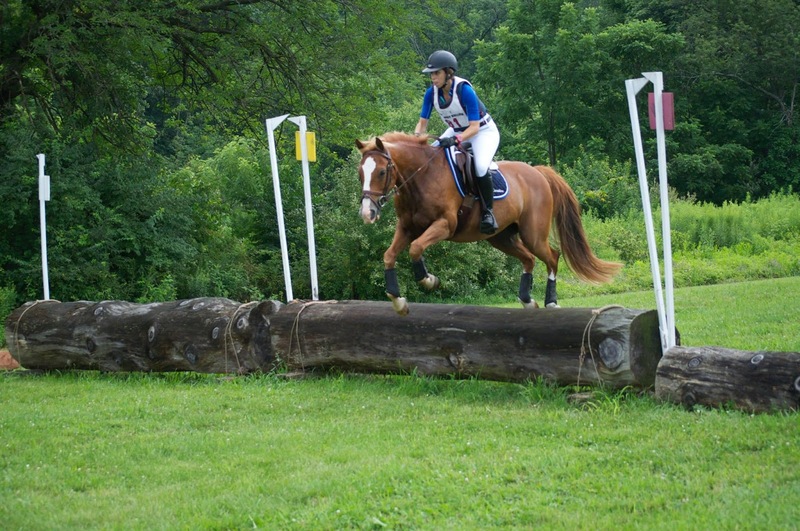 I decided to find a friendly Starter fence towards the end of the course, trot him over that, and be done. Except that little stinker slammed on the brakes at the tiny 2' jump and I went flying over his head. The first fence went OK! And that sucked. A lot. But while I am absolutely disappointed and frustrated about the whole situation, I'm not totally devastated or demoralized. I'm still VERY proud of the work we've done this year and our competition results at the Starter/Elementary level. I'm still sitting on a very different animal than I had under me last summer, and I know that I can get past this disastrous run. If I'm being honest, I could have prepared MUCH better for this show. I was riding on the coattails of our fantastic run at Fair Hill, and assumed we could just wing it at BN since the course was a little softer at Burgundy Hollow. I missed our last chance for a schooling opportunity before this show because of my truck issues, and the smarter, safer choice probably would have been to drop down to Starter level for the XC phase of this horse trial. But I was cocky. So I didn't. And the moment I felt Dino feeling unsure and backed off, I should have galloped the hell out of him to that second fence and taken the flyer just to get him over it instead of trying to hold and put him together for just the right distance. But without his confidence, mine wavered, and I went running back to my comfort zone and started the Stop Cycle all over again. Even so, he should know his job by this point and just jump the jumps even if I'm riding like a soup sandwich! So, I have a training ride planned for Mr. NaughtyPants later this week and lots of schooling in store for both of us before our next HT in September. I'm going to stick to Starter and Elementary level courses until I'm confidently and easily schooling entire BN courses outside of competition, maybe even with some Novice elements thrown in. I'm going to set stadium jumps in a makeshift course around our home property to simulate XC, and once and for all nail that Magic Gallop and learn how to find it consistently. We've got about a month and a half to buckle down and really work on this cross country thing before we compete again! If I am nothing else, I am aggressively optimistic! I'm so sorry the course didn't go as planned. Argh Dino buddy we are gonna have words next time I see you!!! Love your attitude and your plan of attack tho. And agreed wholeheartedly that he really has come out as a whole new horse this year - there's a lot of good stuff happening even if it isn't always happening 100% of the time. You guys got this!! you know you are correct 2 out of 3 aint bad at all.And you know what you need to work on so you already have a game plan....so YAY! And i would kill for a good dressage and a good stadium. Cross Country will come. And you know you guys have this!! I am sorry you fell off but otherwise I think retiring was a good idea and this heat we have been having may have made Dino a wee bit crankier than his usual robust self. I LOVE that you are so positive and spinning it this way. You and he are a great team and it will all come together soon. Sally once told someone while i was there, to show until you are bored to tears at the level you can do comfortably. SO GO INTRO and have fun till you are ready to go back BN! i'm really sorry this show didn't work out, but honestly you sound incredibly optimistic about it still so i'm not too worried. Me neither! I think we can work this through. Ugh sorry that didn't go the way you wanted. It's all 2 steps forward and 1 step back with horses... But you are definitely 2/3 way to being a stellar BN pair! Thank you!! Your encouragement means a lot; I know you've been there, done that! I was pulling for you guys, but sometimes it just doesn't go accordingly to plan. I'm so sorry cross country went how it went, especially after having such a great stadium round and dressage ride. Maybe dealing with his eye and the meds wore him out a little quicker than he normally would? Or maybe he wasn't seeing quite right out in the woods? So many possible reasons I guess. But you definitely have a solid plan moving forward. I'm glad you're not letting one bad phase get you down. Glad you're ok. And hey, at least the white breeches look baller. You're right though -- two outta three isn't bad! And you have a solid plan for tackling the issues and addressing them asap. You have so much to be proud of with all the work you've put in -- you and Dino will be back and better than ever soon! I LOVE your mindset following these events. You're right to be aggressively optimistic and I know you'll get through it. The saying is one step forward, two steps back, but I think y'all have taken four very enthusiastic steps forward and only one stutter backwards this year. You've totally got this and I know you'll be back with gusto by fall. Thank you!! I'm so encouraged by the rest of the progress we've made this year, I'm not going to let this stop me! Sorry it didn't work out out there on XC. Sounds like you have a solid game plan for the next event! Damn - glad you are OK tho. And I love the Meatloaf reference. So sorry to hear that the ride didn't go as planned. What a naughty pony!